Following America's obsession with westerns in the 1950's and the huge success of the Davy Crockett series and films, it seemed a wise choice for the Walt Disney Studios to rush another western into production. Tom Blackburn was chosen to write the screenplay, the same man who wrote all five episodes of Davy Crockett. The star of that series, Fess Parker, was cast as the lead, as well as Jeff York, who played Mike Fink. George Reeves, famous from TVs Adventures of Superman was cast as the group's leader. And to fill the roles of the children, Walt went directly to his new hit series, The Mickey Mouse Club. The studio spared little expense and filmed it in CinemaScope, the third Disney film to be shot in the new ultra-widescreen process. Westward Ho the Wagons! takes place in 1846 as some of the first covered wagons travel to Oregon. When Pawnee indians steal some of their horses, their chances of making it become bleak. One of the children gets captured by the Pawnee and a rescue mission is planned and they get their horses back during battle. At a trading post, some kids trade buffalo hides for Sioux indian robes. However, an altercation with the Sioux over one of the girls who they believe is good luck. The chief arrives that night to make a trade for the girl and the feud is furthered when the settlers refuse. But when the chief's son is sick, the settler's doctor heals the boy and they make peace. The boy is saved and peace is restored as the settlers continue towards Oregon. 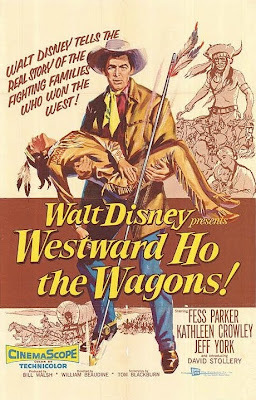 Walt Disney's Westward Ho the Wagons! was released on December 20th, 1956. I was unable to find any anformation on how it performed at the box office or what the critical reception was. However, there are two theme park references to the film. A covered wagon can be found in Frontierland at Disneyland with the words "Westward Ho" painted on the side and in Walt Disney World, a food stand is given the same name. As a film, Westward Ho the Wagons! delivers plenty of entertainment and excitement. The film has several songs which are all great and many of the action scenes are thrilling. Where the film falls flat is the story. If it wasn't filmed in CinemaScope, I would assume that this was a 2-part episode of the Disneyland series that was edited into a feature film. My theory is that it was written for TV and made as a feature instead, which would end up happening a lot with later Disney films. Westward Ho the Wagons! is available on DVD as a Disney Movie Club Exclusive. However, the DVD release is not the original theatrical version, but instead presents the edited 1961 version that aired in two parts on the Disneyland series. Both VHS releases presented the film this way as well. In addition, all releases are presented in pan and scan full screen, so you won't get the full CinemaScope effect and are missing half the picture you should be seeing. This same fullscreen edited version is also available on iTunes. I had never heard of this Disney movie till I read your blog Alex. What a gold mine of information you are. I do hope you get some more visitors willing to get in touch, I know what its like blogging away with very little feed-back. Keep up the excellent work! I now have a link to your blog on my site. "Westward Ho The Wagons" wasn't released in the UK until the summer of 1958, when it went out as the top half of a double bill with "Perri." It's a damn shame that "Westward Ho The Wagons" hasn't been released on DVD in it's original CinemaScope format, as so much of the beauty of the film is missing on the dreadful 4 x 3 pan and scan transfer, as well as the fact that the song "Wringle Wrangle", sung by Fess Parker, is missing from the pan and scan version. Disney should be ashamed of themselves for not releasing this on DVD properly. I went to see the film in 1958, when I was eleven years old and never saw it in CinemaScope again. As I'm now 64, I reckon I'll be six feet under before Disney releases it properly. After all, we post war babyboomers aren't getting any younger. Is there any way to contact Disney with a view to getting this film released properly on a wide screen DVD? Hello Mr. Rayner. I too am a analystic movie buff and I share your disappointment wholeheartedly for the Disney classic on DVD. Because Westward,Ho the wagons is originated in the 2.35aspect ratio. I spoke with a technician that's a castmember with Buena Vista ent. And he assured me that he wrote it down as a important memo to express it with the rest of staff & management. If u like please contact me @ Dextr_Cooper@Yahoo.com just make sure that you got my message. Thank you very kindly. I hope this helps and I would LOVE if they would release to full theatrical version in Cinemascope! Thanks for the link, Alex. I used it to contact Disney about the film three weeks ago and have not yet heard back from them. Well, nearly three months later and still no reply from Disney. It looks like they're not going to answer me.